Voyager 2 may have been the second of NASA’s famous twin exploration spacecraft but it actually launched first, on August 20, 1977. Eight and a half years later it became the first (and, to date, last) spacecraft to visit Uranus, at 31,500 miles across the third largest planet in the Solar System. Voyager 2 made its closest pass by Uranus 32 years ago, giving us our best views ever of the enormous ice giant planet and its moons. On January 24, 1986, Voyager 2 approached within 50,600 miles of Uranus—about twice the distance that geosynchronous satellites orbit Earth—gathering images of the sideways planet, its rings and several of its moons. Voyager 2 also discovered the presence of a magnetic field as well as ten previously-unknown moons and determined Uranus’ rotational rate at 17 hours and 14 minutes. 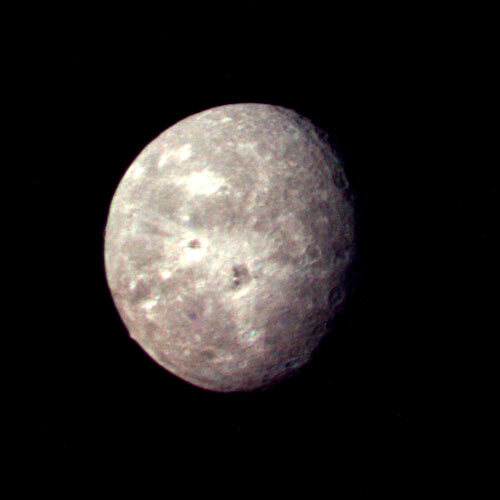 The image above shows a crescent-lit Uranus as seen by Voyager 2 on January 25, 1986, from a distance of about 600,000 miles as the spacecraft sped away toward Neptune. Composed of large amounts of hydrogen and helium, Uranus’ atmosphere absorbs most of the red wavelengths of light and thus it appears bluish-green to our eyes. 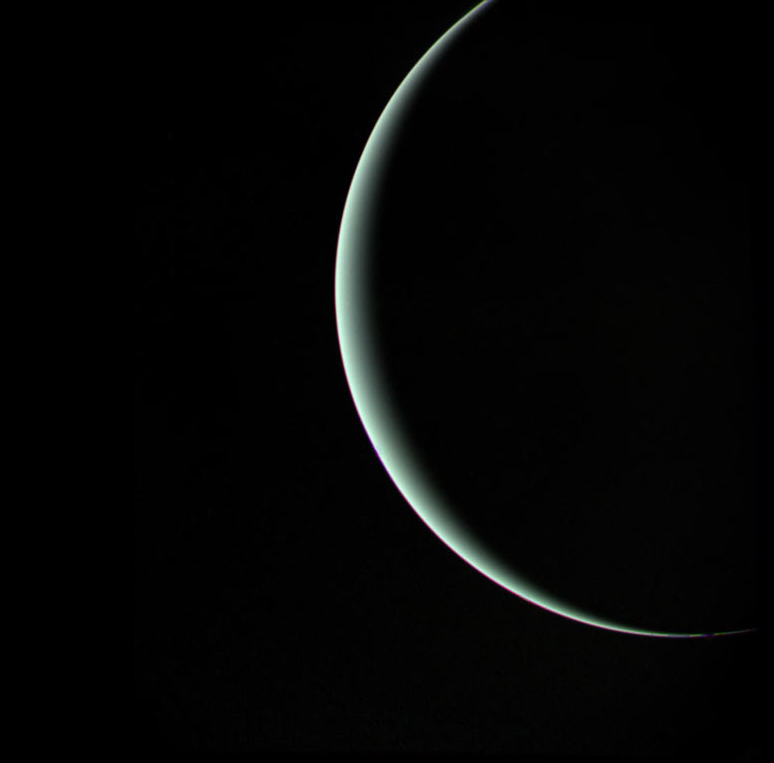 See more images from Voyager 2’s visit of Uranus here, and check out a video of Voyager 2’s launch below along with some images from the historic mission’s “Grand Tour” of the outer Solar System. Both Voyager 1 and 2 are now headed out of the Solar System, crossing the boundary between the Sun’s solar wind and high-energy-particle-infused interstellar space. Voyager 1 is 13.16 billion miles from Earth; Voyager 2 10.9 billion miles away. A signal from each takes over 31 hours to reach us. 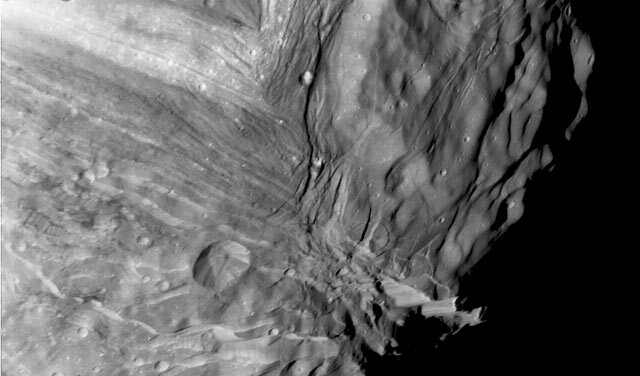 Learn more about the ongoing Voyager mission here. 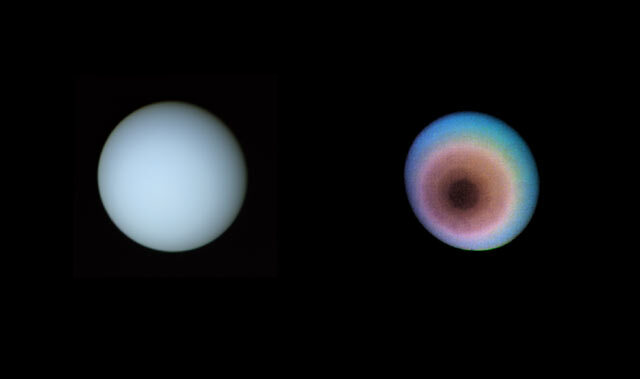 A revisit of Uranus and Neptune by new, modern planetary exploration spacecraft has been considered by scientists but because of the positions of the outer planets and their long periods of revolution around the Sun (84.3 years for Uranus, 165 for Neptune) launch windows are few and far between; it was only through pure luck that the Voyager mission was able to accomplish what it did when it did. Even were a mission to Uranus to be approved and built, reasonable estimates put the next possible launch window around 2030-2034. Read more here.